Looking for the perfect party food? 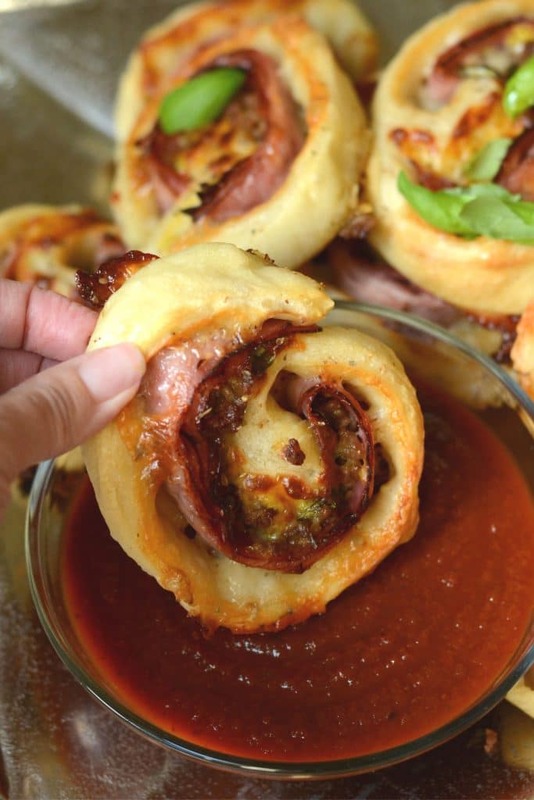 These delicious stromboli roll ups are easy to make, and absolutely addicting. Your friends will beg you for the recipe. One of the first things I learned about my husband was that he LOVES stromboli. Not just any stromboli, though. He is particularly obsessed with the stromboli from a restaurant called Your Place in Hershey, PA.
It’s unique in that it doesn’t contain pepperoni like many strombolis do — it has ham, sausage, and salami, along with a signature ingredient that most people don’t associate with stromboli ingredients: mustard! In the almost 20 years (gulp) since we moved away from PA, I’ve tried to recreate his favorite stromboli recipe numerous times. My results were typically delicious, but there was one thing I couldn’t quite get right. For the life of me, I just could not get my dough to achieve the same crispy/chewy texture of the original. Of course, I don’t have access to a commercial pizza oven, nor do I have the time and energy to make dough from scratch. Still, I made it my goal to create a version of that favorite stromboli that would nail the flavors AND the texture of the original while keeping it simple. I finally met with success when I decided to SLICE the stromboli and bake the slices on a baking sheet rather than baking it whole. This gave the crust a delicious crispness, and also made the stromboli a whole lot easier to serve and eat. 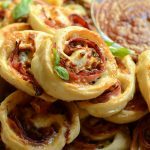 Stromboli roll ups were born! Now that I’ve created this recipe, I doubt I’ll ever go back to making stromboli the old fashioned way. These roll ups are perfect for a party, and they’re filling enough to count as a meal. 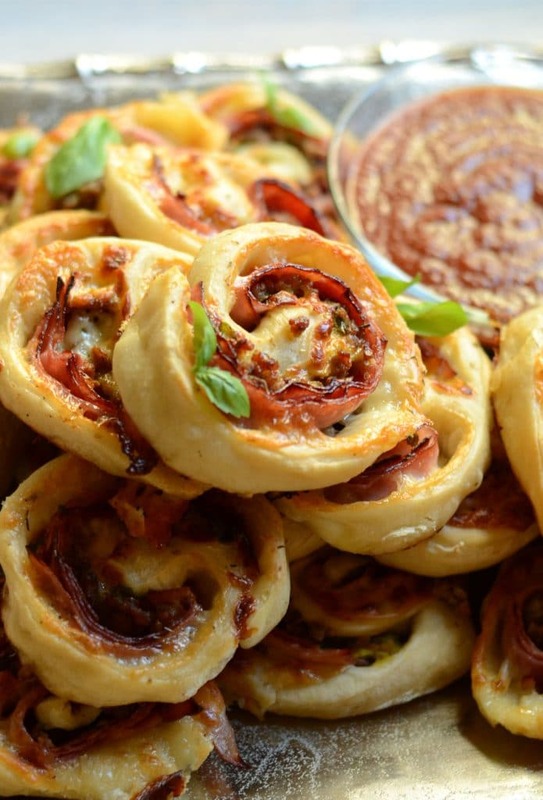 This recipe comes together really quickly if you use store bought pizza dough. Of course, if you want to make your own dough, you’re welcome to, but I’m all about easy shortcuts. 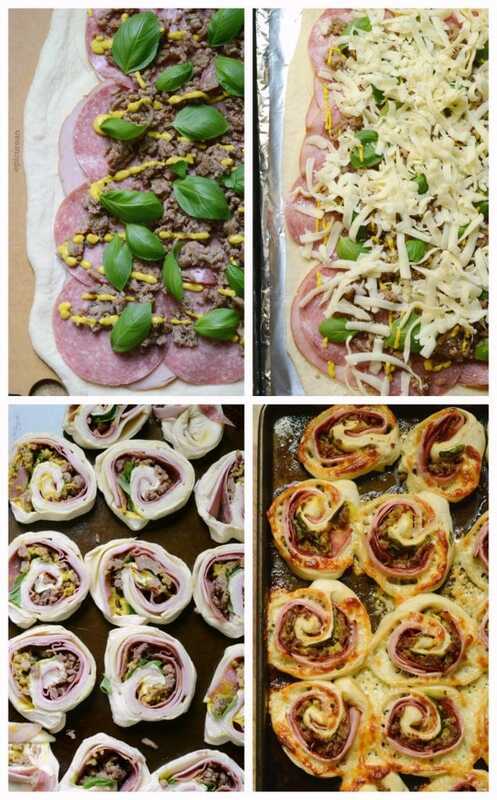 Just roll out the dough, layer on the toppings, roll it, slice it, bake it, and you’re done! I highly recommend using nonstick aluminum foil for this recipe. For my first attempt, I cooked it straight in the pan, and it was difficult to get the roll ups off of the pan, even though I used olive oil. When I used the nonstick foil, they came right off. Using foil also makes the pan a heck of a lot easier to clean. The most difficult part about this recipe is stretching out the dough to the desired size. If you’re struggling with your dough, I recommend following these key steps to stretching pizza dough. If you want to make slicing a bit easier, I suggest wrapping the uncooked stromboli log in non-stick aluminum foil, and then putting it into the freezer for about 10 minutes. It will help everything stay together when it’s time to slice it. When the roll ups are cooked, the bottom develops this amazing golden brown crusty-crispy-cheesiness that’s to die for. I hope you’ll make these for your friends and/or family. And when you do, come back and tell me about it! 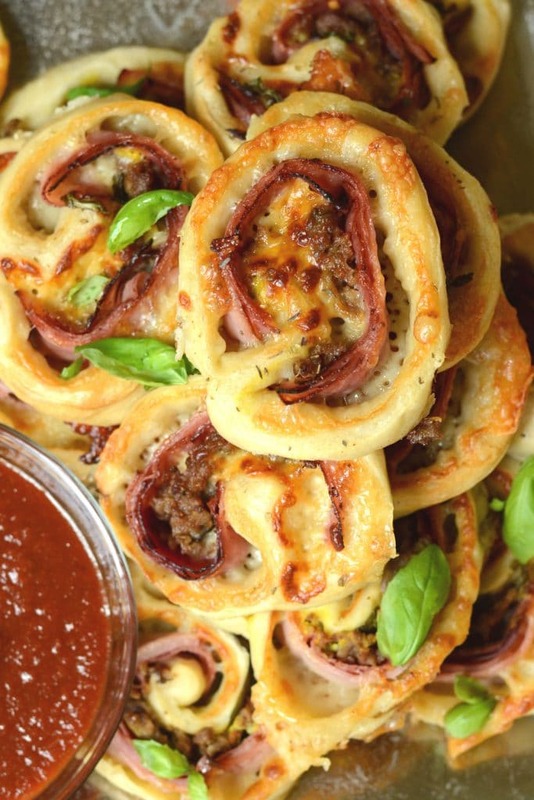 All of the delicious flavors of stromboli in an easy hand-held appetizer. In a skillet, brown sausage until fully cooked. Drain grease, and set sausage aside to cool. On a floured surface, roll out dough to a rectangle approx 10" x 15." Add a layer of provolone cheese, leaving approx one inch of dough around the border. Layer on the ham, salami, and sausage. Drizzle a small amount of yellow mustard over the mixture and add fresh basil leaves. Sprinkle mozzarella evenly over the dough. Starting on one long side, roll the dough up tightly to create a log. Slice off and discard the ends, and then cut the log into 1-inch slices (You should have about 12 slices). Place slices on rimmed baking sheet lined with nonstick aluminum foil, leaving some space between the slices. Sprinkle with dried oregano. Bake at 425 for approximately 20-25 minutes, or until dough is browned. Serve immediately with pizza sauce or marinara for dipping. 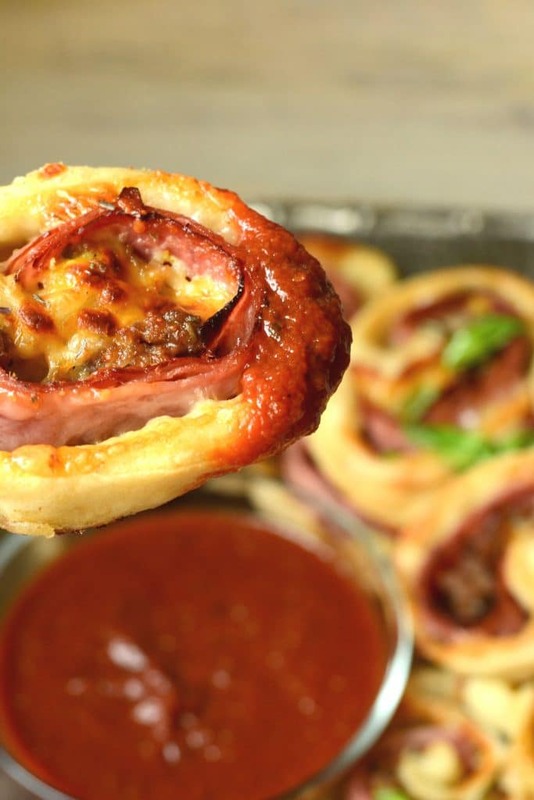 This is absolute genius and makes the whole idea of a stromboli so much more appealing to me, I want to bit into one of these crisp slices now! What a great app! Definitely putting these on my holiday list. My whole family will love them! I totally forgot about stromboli! I haven’t had it since I was a teenager! Your recipe looks so delicious and easy! 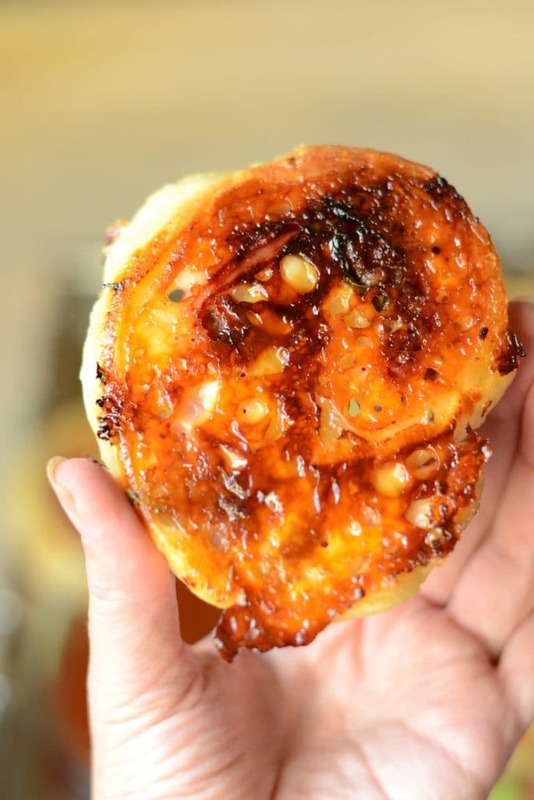 I bet this would be a perfect appetizer at a dinner party!